Prohibition Agents Charles Carroll Rouse, Eugene Jackson and George Busch had received information that illicit liquor was being delivered nightly to a house on Wayson Alley, in Baltimore, MD. During surveillance, agents noticed a suspicious car parked next to an open garage. Agents Jackson and Busch ran into the alley, announced their identity and arrested two men unloading liquor. Agent Rouse arrived and saw shadows moving inside the garage. Concerned for the safety of his fellow agents, he stepped into the garage to investigate and gunshots immediately erupted. A volley of gunfire was exchanged between Agent Rouse and an unknown suspect. Agent Rouse was seriously wounded and rushed to Mercy Hospital, where he died five days later. Suspect Laveri Guiseppe was arrested for the murder of Agent Rouse. Agent Rouse joined the Prohibition Unit on July 31, 1924, with an annual salary of $1,680. 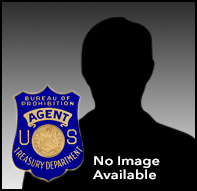 Agent Rouse was born in Fauquier County, VA. He was survived by his wife, Lillian. He is buried in Alexandria, VA.